I’ve posted before about the noticeable shift in focus and price hike Taco Bell has undergone recently. Actually, on a recent T-Bell trip, the Loaded Grillers themselves had been hiked to about $1.19, making them all but worthless. But the flip side of Taco Bell’s gentrification is a new classier menu by celebrity chef Lorena Garcia, the Cantina line. These new offerings include a couple of burritos and salads, as well as a new guacamole, made with Hass avocados (a distinction that sounds fancy but means nothing to me. Hass avocados could very well be the lowest quality avocados that can legally be sold, for all I know). Surprisingly enough, it actually looks a lot like this in real life. Who would’ve guessed? I’ve had both the steak and the chicken Cantina burritos, and I’m of two minds about them. On the one hand, it’s nice to see Taco Bell branching out a little bit. In addition to the meats, the burritos contain black beans and rice, guacamole, pico de gallo, roasted corn and pepper salsa, and a cilantro dressing. There are a lot of comparatively new items here, and both the ingredients (corn and cilantro especially) and the combinations (it’s basically all sauces and medleys working together) show the clear involvement of a master chef. It’s a tasty burrito set apart from normal Taco Bell fare. But at the same time, it’s very similar to the kind of thing you can get a Chipotle or Qdoba, not to mention any number of local places. It’s a big step for Taco Bell because the bar is set comparatively low, but what’s remarkable here is only kind of average elsewhere. 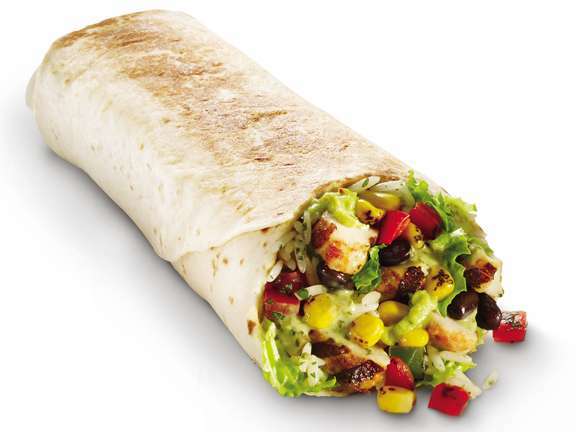 The Cantina Burrito goes for about $7.50 in a combo, and is a dollar or so cheaper a la carte. It’s on the pricier end of the menu, and it’s kind of a hard sell compared to other stuff both here and elsewhere. But if Taco Bell wants to refine and rebrand a little bit, as it seems they do, it’s a good start, and I’d recommend checking it out if for no other reason than to see where things may be going.